The 3rd house rules your communication style, your siblings, your close environment, and short distance travel. How you learn and communicate is shown by the sign on the cusp and any planets within the house. 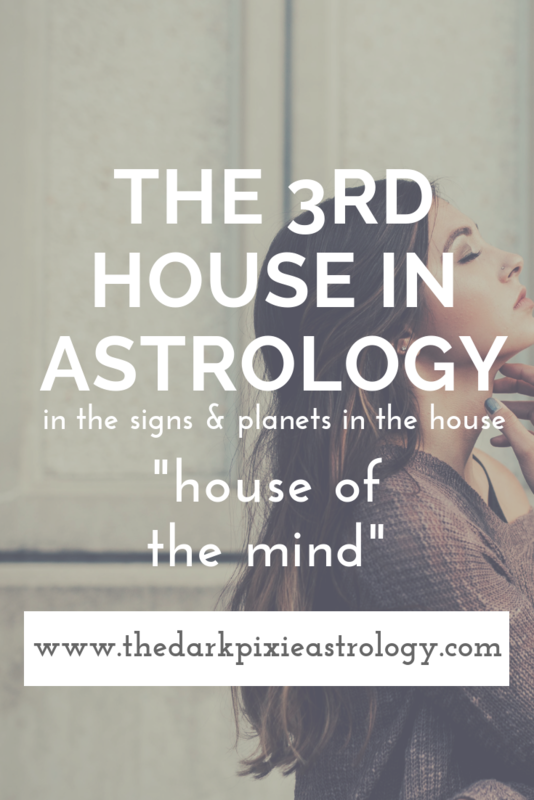 The 3rd house also rules your younger years of education (before college/university/trade school etc.) and how you approached school and what your experiences were during that time. The relationship you have with your siblings is shown with this house. Your neighborhood, the kind you're drawn to and how you participate within it, is also shown here. The 3rd house rules short distance travel (anywhere you can drive to in a few hours; usually every day travels). Mercury and Gemini rule the 3rd house, and it's a cadent house. You mind moves at a fast pace, and you come up with ideas quickly. You feel the need to share your thoughts and opinions with others. You don’t rely on anyone else to think for you, and can express yourself easily. You’re eager to learn new things, but you have trouble sticking with anything long enough to really learn it. You can be mentally aggressive, prone to arguments and defending your ideas, and short-tempered, so you need to make sure you have an outlet for the excess energy to prevent periodic explosions. It can take a long time for you to learn something, and it might seem like you don’t care about learning on the surface because of that. When you dedicate yourself to learning something, you’ll stick with it until you’ve got it, no matter how long it takes, and you’ll remember it for the rest of your life. Learning could be easier for you when you involve your senses, and you can take in knowledge using what you see, hear, smell, taste, and touch to help you. Playing soft music while studying or trying to absorb something new could help as well. Gemini is the natural ruler of the 3rd house, so having Gemini here denotes you have a mind that is naturally quick and an ease in communication. You require mental stimulation, love conversation with others, are a social person, and can take in facts easily. You have an easy time dealing with the small details, but can struggle with the bigger picture and large projects. You’re open to new ideas, and understand different modes of thought. While your mind moves quickly, it can be too quick at times, and when that happens, you can have a hard time communicating effectively. Once you commit something to memory, you’ll never forget it. You have one of the longest memories out there, especially when it comes to anything that impacts you emotionally. You never forget the emotions you felt and that coursed through others in any given situation. While this makes you understanding, it can also make it hard for you to be objective. Learning may have been difficult for you as a child, and it makes you sensitive when it comes to learning as an adult. If you have siblings, they likely played an important role in your childhood. You can be theatrical when you express yourself, dominant in conversations, and someone who knows how to entertain. You may not know exactly what you’re talking about, but you know how to make it so that no one cares if you do. Your mind is creative, and you enjoy gossiping, joking around, and having a good laugh. You can be surprisingly stubborn when it comes to your thoughts, and need to learn to be more open to other people’s opinions. Words can wound your pride, and when someone cuts you in this way, it runs deep and perhaps forever. Communicating may have been especially difficult for you when you were young, not because of any problem with your mind, but because of insecurity and doubt about your thoughts and opinions. You felt like what you had to say just didn’t matter as much as what other people said. You have a strong mind centered around logic and reason, and you need to learn to feed your mind. You’re excellent with the details, practical, and able to dedicate yourself to any mental work required of you. You can be critical of other people’s opinions, or of your siblings or neighbors. You’re a pleasant communicator, someone who communications with grace and style. You may be a creative or artistic person as a result. You can charm people with your words, talk people into compromising and finding middle ground no matter how much they resist, and you’re not forceful or demanding. You avoid conflict and arguments, wanting everyone to get along. Without mental balance and harmony, you feel off in life. You can get along well with siblings or neighbors, knowing just what to say to get them to calm down and work with you. You believe strongly in what you think and say, your opinions and beliefs, and won’t budge from your position. You can dominate other people, are intense in your communications, and overwhelm others. Words can help you transform in life, or you can use your words to help transform others. You’re researching and won’t stop digging into something until you’ve gotten to the core. When something interests you, you can become obsessed with it. You can be too judgmental, and may feel that people should do whatever you tell them to. You tend to be an optimistic person, looking at the brighter side of situations, and don’t want to get too down about anything. You keep communications light and fun, wanting to laugh and have a good time. You’re interested in learning about the world, worldly issues, and look at the big picture, but the details can escape you. You love to learn, but can do better learning on your own. You want to expand your mind whenever you get the chance, and enjoy exposing yourself to new cultures and ways of living. When you talk, you do so in a big way, and are an excellent storyteller. You’re also quite honest. You don’t like to express your thoughts or opinions with others until you’ve carefully reviewed what you’re going to say, and believe that it needs to be said. You try to only say what needs to be said, and don’t waste your time on anything else. If you don’t have something productive say, you won’t say anything at all. You may seem quiet or secretive as a result. Learning or getting an education may have been difficult when young for some reason, and as you get older, you take studying seriously, and can use it to help you achieve your goals. You love to learn, and you don’t need to learn to gain anything except knowledge. You want to share your knowledge with other people, and can be a great teacher. You’re open to new modes of thoughts, new ways to express yourself, original ideas, and are forward-thinking. You may not have patience for anyone who isn’t the same way as you though, and need to not be so critical of people who aren’t as open or unique. You can speak before you take the time to say anything, and this can put you in situations you don’t want to be in. Over time, you can merge your emotions and your mind together to create a powerful force. Until then, you can have a hard time communicating clearly or understanding the details. Your emotions can cloud your judgment, and they prevent you from being able to communicate. This is usually a problem in your youth. As you evolve, you become more creative, intuitive in your communications, and can see through what people say to what they really mean. You come up with your best ideas on your own, and require a certain amount of time alone to recharge your mind. With your natal Sun in the 3rd house, if there isn’t enough change in your life regularly, you get bored fast. You can adapt to new situations easily, and with your incredibly active mind, you need that change often so your mind doesn’t become restless and idle. You love to learn new things, whether you liked school or not, and you can take in new information easily. You want to do whatever you do well, and part of your love of learning comes from wanting to be as good as possible at whatever you do. You learn a lot through life experience. You’re likely a chatty person, always wanting to find out as much as you can about everyone and everything, so watch for being a gossip. You need constant mental stimulation, and you likely love to study (maybe not everything, but at least the things you’re interested in, you’ll soak up). You’re a very curious person, always wanting to know more about people/situations, so just be sure you’re not stepping on any toes. You may be good at remembering details, and you may have a lot of random knowledge. Your mind is active, so you likely have a good imagination and you can be creative, especially with anything to do with words. A normal life may not be something you desire, because you always want excitement. Some may let their mind override their emotions, and inject too much logic into their feelings, while others may let their emotions override their mind, and be irrational and illogical. Your emotions color your thoughts no matter what, so trying to find harmony between the two is key. You likely love to communicate with people, and at times you may have problems with anxiety, over thinking things. You can understand other people’s feelings well, but must be careful you don’t take them on as your own. With your natal Venus in your 3rd house, you have a way with words, and know exactly what to say to people to get them to do what you want. This can make you manipulative, though you’re rarely malicious about it. You can play head games with people though, and are inclined to gossip or twist the truth to get what you want. You give people compliments as a way to get people on your side. You may be a good writer or speaker, or be interested in language and learn several of them. When it comes to learning, you can have an easier time picking things up, but you can also be lazy about it, as if it comes too easy for you, so you don’t need to put in as much work. With your natal Mars in your 3rd house, you don’t think much before you speak, and you can be honest to a fault because of it. Your mind is active and your interests are varied, though your attention span is short. When you have something to say, you get right to it, and don’t waste any time. You’re concerned about other people’s opinions, and like to debate matters. You’re good with your hands, and can be a dynamic communicator, though you need to watch for being overly aggressive in your communications. You have strong opinions, could make a good writer, and are confident in the knowledge that you’ve obtained. With your natal Jupiter in your 3rd house, no matter how you feel, you come across as feeling great. Even when you’re sad or full of despair, you keep your tone light and happy. Communicating comes easy for you, as does learning and sibling relations. You can talk the talk but not walk the walk. The information that you absorb needs to have value, otherwise you just take in a lot of random, useless knowledge. You like to learn, making you an eternal student. You like being around people and being sociable, and people find you easy to get along with. With your natal Saturn in your 3rd house, you can have a hard time dealing with your daily life, everyday tasks, and your routine. You may shy away from your neighbors, have trouble talking to cashiers, get into accidents in your neighborhood, and feel bored with daily life even though you resist changing your routine. If you have siblings, you or one of them may have been like a parent, or you didn’t get along well. Electronics may seem like your enemy, always breaking down somehow, and you may go through clunkers with cars (though if you’d cough up enough dough, you might not have as many lemons). With your natal Uranus in your 3rd house, you communicate in usual ways. You’re attracted to innovative ideas and original thinkers, and you can be quite forward-thinking. You’re a friendly person, sociable, and humorous. You approach your daily life and tasks in unusual ways, hating having a boring life. This leads you to be different, even eccentric, in many ways, but people like you because of your openness and friendliness. You may have a sharp mind, but could’ve struggled in school because it couldn’t keep your interest, or you could’ve been advanced for your age and bored out of your mind. If you have siblings, they could be unusual, or you have an unusual relationship with them. With your natal Pluto in your 3rd house, you dive deep into every subject or project you’re presented with. You can’t take people at their word or accept things on the surface. You have to dig below the surface, getting to the inner truth at the core of the matter. When you talk, people listen to you. You radiate power and purpose when you speak, and it forces people to take you seriously. You prefer to learn things on your own, so you may have shunned teachers growing up. With transit Mercury in your 3rd house, it’s hard for you to slow your mind down. You’re constantly thinking about things, and you jump from one thought to the next quickly, not spending much time on any one thing, so this isn’t a good period for dealing with big or long-term projects. You may take many short trips, always finding yourself in the car or on the bus. You could have to deal with technology more than usual. You have more communications with people, and everyone has something to say to you and vice versa. You could begin many new tasks and tackle the smaller ones. This is a good time to start learning something new, take tests, or begin a writing project. You could have an important conversation with a sibling or neighbor. When transit Mars is in your 3rd house, you’re driven to communicate openly. There’s a lot that you have to say, and you’re going to say it. Any conversations that need to be had, you try to have now. Your mind is much more active, and this can be good for mental projects and intellectual pursuits. You need to stay busy though, otherwise the mental activity will lead to anxiousness. Keep your mind occupied. You can find yourself in a car or bus or train more than usual, traveling short distances. Your schedule is packed, and you’re more social and engaging with others. You’re a little more scatterbrained, and take on many different projects that could be hard to keep track of. You could become active in your neighborhood or community, deal with young people, or start learning something new. If you’re prone to headaches/migraines, you could have more now.